Before you can install a new fence, you have to remove the old one. How long the existing fence has been in place and how it was originally installed will determine how much effort you need to put into removing it. Tearing down the walls of the fence will be easy and will take a relatively short period of time. However, removing the posts will require some skills, especially if they were installed to remain in position for an extended period of time. You will be dealing with either a straight pull or a 100lb block of cement buried four to five feet below the surface of the ground. If you did not install the fence, you might want to find out who did it and how. This will help you determine what type of tools you will need to remove it. You will also want to make sure you own the entire fence. In some areas, you will own half, and your neighbor will own half. This means they are responsible for their section of the fence, including the cost of repairs and installation. It is better to know these things before you start than learning about them halfway through. Never dig without knowing what is underground. People who have owned their property for several years may know what changes have been made by local utility companies. Always call local utilities before moving your posts to make sure there is no cable buried near or within a few years of the fence. The walls of the fence are fairly easy for one person to handle alone. Posts can be a bit of a challenge, especially if you do not know how far they extend underground. Ask your friends to help you maneuver the posts out of the ground. They would help you keep the posts from falling to either side or damaging surrounding objects. Before taking out the posts, make sure you have cleared away any obstacles that could cause you to trip and fall. If you are using a lawn tractor or ATV to pull the posts out of the ground, make sure there is enough room for the posts to fall without hitting you or the tractor. Working with friends is beneficial when using a tractor. They can help guide the posts as you are removing them. 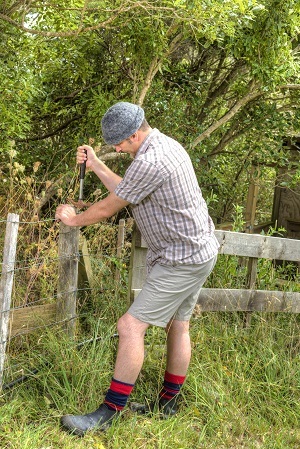 Use a heavy rope or sturdy chain to secure the posts before pulling them out of the ground. When pulling away, accelerate slowly and increase the gas only after you feel the tug of the chain or rope tighten around the posts. This will prevent you from being jerked or thrown from the tractor. It will also protect you if the rope comes loose and flashes back towards you. Make sure you have the right tools. Gloves and eye protection are extremely important when tearing down any type of structure. Flying pieces of debris are unpredictable and can land in your eye or become sharp splinters. Take your time and make sure you maintain control of both yourself and the tools you are using. After your posts have been taken out, make sure to fill in each hole carefully. If you plan on installing a new fence and using the existing holes, make sure they are well marked or covered with plywood until you are ready to replace the posts. Always make sure you have all of the materials you need before you begin the project. Once the fence is partially removed, it can pose a hazard if it is not adequately stabilized. Learn how to easily remove your old fence for a new one. There are few simple installation tips that must be considered while removing your fence. This entry was posted in Fencing Guide and tagged Fence Installation, Fence repair, Old fence removal. Bookmark the permalink.